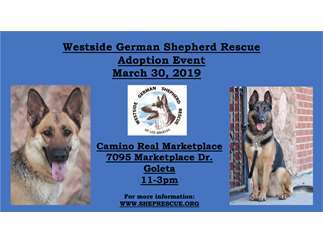 Westside German Shepherd Rescue and C.A.R.E.4Paws have come together for a German Shepherd adoption event and Pet Wellness Clinic. There will be many wonderful adoptable dogs looking for their forever homes and low cost vaccinations, micro-chipping, flea treatment, and other pet health services. For more information see www.sheprescue.org and www.CARE4Paws.org.